Forty-seven years ago today, on November 2, 1965, Quaker anti-Vietnam War activist Norman Morrison walked to the steps of the Pentagon, poured kerosene over his head and lit himself on fire. Morrison was one among numerous others who did so during those years, in both Vietnam and the United States, to protest the war. Before and after him, self-immolation has been practiced for centuries all around the world. 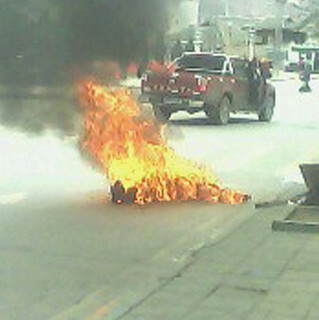 Yet nowhere have self-immolations occurred more in recent months than in Tibet. Since I and others stood outside the Chinese consulate on the morning of November 2 last year in a “Stand Up for Tibet” day of action, at least 50 Tibetans have lit themselves on fire in their ongoing struggle for freedom. Seven of these incidents occurred only in the last week — the highest number of self-immolations in one week yet on record. In response to the most recent immolations and in support of Lhakar, a new cultural resistance movement in Tibet, solidarity groups held a day of action this past Wednesday, October 31. Activists held an online press conference on self-immolation in the morning, and evening vigils occurred across the globe. Then, in Toronto yesterday, Tibetans and supporters protested the proposed sale of Nexen, a Canadian oil company, to CNOOC Limited, a Chinese state-owned oil company that has funded the forced resettlement of Tibetan nomads to clear land for oil and mineral extraction. Efforts like these are working to amplify desperate acts of self-immolation into a shift in human rights discourse that could have significant effects for Tibetans and those enduring similar conditions. To understand how, it’s worthwhile to begin by asking: Why is self-immolation occurring at such a rapid rate in Tibet right now? Why is it being seen as a necessary form of protest? Looking at the profile and the background of the self-immolators, we can see that their distress was related to different policies, namely policies related to religious freedom, language, environment and also the forced resettlement of Tibetan nomads. Many of those who have set fire to themselves have been from the Kham and Amdo regions of Tibet, areas heavily populated by a nomadic population. In 1998 China’s agricultural vice minister Qi Jingfa declared, “All herdsmen are expected to end the nomadic way of life by the end of the century.” By 2011, Chinese state media reported that 1.43 million nomadic Tibetans had been relocated. Nomadrights.com explains the impact this has had on the nomadic population: “Efforts to force Tibetans into reservation-style housing blocks is causing massive social and economic problems including unemployment, alcoholism and suicide.” This forced relocation of Tibetan nomads, meanwhile, has been spurred by the motivation of clearing land for the construction of dams and mining projects. Another community heavily affected by self-immolations has been Tibetan Buddhist monks and nuns, whose religious traditions have been suppressed under Chinese rule. In the Tibetan Buddhist tradition, the Dalai Lama represents the incarnate Bodhisttva of Compassion, an object of veneration. Yet today in Tibet, praising or even possessing photos of the Dalai Lama is severely punished by Chinese authorities. Tibetans have reached a breaking point: from the level of control in the monasteries, to the crackdown on Tibetan language to the forced resettlement of Tibetan nomads, repressive policies are leading to this new wave of protest that have taken the form of self-immolation. Although Tibetans and their supporters repeatedly claim they are experiencing a “cultural genocide,” the term has never been validated in official international definitions of genocide. During the drafting of the The U.N. Convention on Genocide in 1948, the concept of “cultural genocide” was fiercely debated, yet in the end it was excluded. Arab and communist nations tended to favor the inclusion of cultural genocide in the convention, arguing that there existed strong links between violence directed at particular groups and the idea of cultural genocide. Western democratic countries, including the United States, however, favored the exclusion of cultural genocide from the convention, arguing that such a definition “diluted” the definition of genocide. In 1994 the concept of cultural genocide was again introduced before the United Nations in a draft of the Declaration on the Rights of Indigenous Peoples. The draft included a provision stating that indigenous people had the “right not to be subjected to ethnocide or cultural genocide.” Yet these specific terms — “ethnocide” and “cultural genocide” — were eventually also dropped from the final version of the document, ensuring that the definition of “genocide” would continue to pertain only to physical death. there is a movement towards a broadened conception of genocide that encompasses the intention to eliminate a group’s culture-carrying capacity. It links practices intended to undermine cultural institutions — whether through restrictions on its traditional practices, destruction of religious institutions and objects, the persecution of spiritual teachers, or attacks on cultural figures and intellectuals — to the physical genocide that has been the focal point of conventional genocide prohibitions. Drawing on this momentum, the International Campaign for Tibet offered its own working definition of genocide in that report and is pushing for legal standards to address cultural genocide as a crisis for human rights. “I long for freedom from the English yoke, I would pay any price for it,” Mohandas Gandhi once wrote. “Anything would be better than this living death of a whole people.” The “living death” that Gandhi described refers not primarily to the suffering of the body but to the lack of political emancipation. Yet his words help us understand the bodily suffering that people have been willing to take upon themselves for freedom in Tibet. The aspiration of their tactic is, perhaps, captured in the title of Black Panthers co-founder Huey P. Newton’s autobiography, Revolutionary Suicide. Tibetans are fighting for their lives, but they are also fighting for something that, for them, is even more important than life, as they have demonstrated through their willingness to undergo self-immolation: their cultural identity. Where was the UN in 1950-51? Too busy with Korea. Sounds like what the US government did here, plus the Turks against the Armenians together. While this type of genocide has been standard human procedure, it’s still inexcusable, just as horrific, more so as this stuff continues into the 21st Century. Collectively, we allow our federal government to be one of those giants. We have blood on our, collective, hands. Active nonviolence is nt the power of the weak bt of the strong.lyk the Egyptians,i knw thy’l achiv thr frdm frm cultural genocide. We as a country have had blood on our hands since our country was founded. Look what we have done to the Native American population since 1776… See any similarity? I know you were asking Eric, but wanted to express that I definitely see the similarity between colonization in Tibet and the ongoing colonization and occupation that forms “the united states”. I spent part of this summer visiting Black Mesa in northern AZ with an amazing group called Black Mesa Indigenous Support that supports elders on the reservation who have been effected by forced relocation efforts in the interest of mining projects. So the interests of mining and extraction intermixed with moving people off their land and destroying their ways of life and culture(which are closely related to living off the land) are definitely one of many ways these two contexts deeply connect and overlap. Thank you for making the connection in your comment. Thanks Betsy for the insightful post on the Tibetan freedom struggle’s use of active nonviolence. Hope to see more of your writing here soon.